There are a bunch of different beads available, so no matter what your preference I bet you could get a set that’s your favorite colors. My markers are black and a really pretty silver-blue. These are nicely made markers with no rough edges or pokey bits to snag the finest yarn. And at a very reasonable price! Love ’em, love ’em, love ’em. Love the little ladybugs, too. OK. Who doesn’t love a lady bug? Sometimes my larger projects need a little bling, too. I’m using one of the ladybug markers on a top secret project (shhhh… ), and every time that little lady bug comes around, I just have to smile at it looking up at me with its beady little eyes. I fancy it’s saying, OK. But I’d really rather prefer eating aphids in the garden. When you were a child and a ladybug landed on you, did you used to say the little rhyme Ladybug, Ladybug, fly away home. Your house is on fire, your children will burn. When I was little, my mother taught that to me and to this day I still faithfully recite it to the ladybugs in the garden. But it is rather morbid, isn’t it? A rather strange sentiment. I would love to show you how fun the little ladybug looks flying around my needle, but it’s a secret project. So, it’s… secret. All will be revealed in time. By the way, there are other really cute little beads where these came from: penguins and fish. You must go look at the little penguins! You will die from the cuteness. 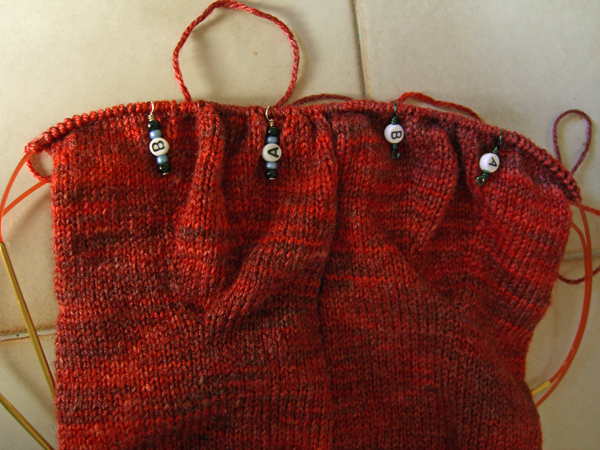 My socks feel so nicely balanced, now that I have the right stitch markers on both socks. Ahhhhh…. This is the instep side. 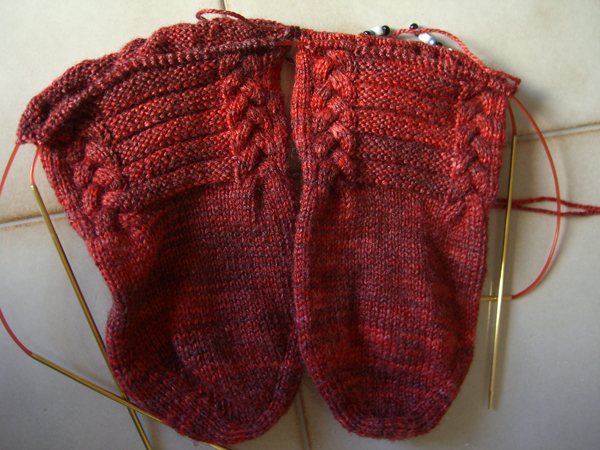 I have one more pattern repeat to go, and then I turn the heels. These socks are almost knitting themselves. Maybe it’s because the pattern repeat is only 6 rounds, or because the cables turn every three rounds, but I always feel like I’m making progress. And before you know it, I’m almost done with this section. Except they’re on hold right now. Because I have to work on the secret project. #1 Son: Hi, Mom. Just wanted to let you know I’m on my way to California. Mom (attempting to shift mental gears quickly): You are? Why? Don’t you have to go to work? #1 Son: I don’t have any hours scheduled until Saturday. A friend has a family member who is very sick. She needed someone to go with her and there isn’t anybody else that’s available. We’re taking her car. I’ll be back Saturday morning. Mom: Where are you going? Bay area? #1 Son: San Luis Obispo. But we’ll probably spend tonight in the Bay Area then drive the rest of the way tomorrow. Her car is a little car with standard transmission. Driving a stick is really fun. Mom: I love you. Please drive carefully. Gentle reader, if you are the parent of an almost-adult-ish teenager, how are you coping? One of the things I do to cope is to concentrate on other things. Like the software under the covers of this blog. I use a lot of plugins to do various cool things like the little gadgets in the sidebars, and the spell checker, and the doohickey that closes commenting on a post after a particular length of time. Sometimes one or the other of the plugins has issues. And sometimes it’s darned hard to figure out which one it is. Lately, every time I publish a post, the sidebars would only load a little way down the left hand side, and then nothing more would load. The only way I could get the site to load all the way again was to turn off some of the plugins. So, one after another, you may have noticed things disappearing. And coming back. And disappearing again. And going wonky. Yesterday I finally figured out what it was. It was the little word cloud in the left-hand sidebar. The plugin that builds the cloud takes all of the words from every post I’ve ever written, sorts them out, eliminates words like the, and, but, takes the top words, and makes the little cloud. Well… it turns out that I’ve been kinda wordy. Go figure! The poor thing was just choking on the number of words that my fingers have typed over the years. I’ve taken pity on it, and limited its cloud-making effort to the most recent 500 posts. Can you believe I’ve written more than 500 posts? Me either. [ed.] And everything is OK. Yea! And #1 Son just called to report he is just north of Redding, they will be driving all night, and he’ll be home early in the morning. My request that he be careful and drive safely was met with: Why do you worry? I’ve done this millions of times. To which I can only reply, I worry because I’m your mother. It’s my job. Are you kidding me? First, you tease & torment me with Cat’s book, of which I ordered, and now it looks like I’m heading over to Etsy to buy TWO sets of stitch-markers, since I also knit both socks at the same time. Next time I open up your blog page, I might as well have my credit card handy to go shopping. Did you get training for this enabling or is it just a natural talent? Oh, right. Like no enabling happens when I visit your blog! A little turn about is fair play. Having just driven from Bremerton, WA to Phx, AZ via the I-5, all the way through CA – you have every right to worry! I got a little anxious just reading your post! But then again, I did live through it – and he lived through it and he did a very nice thing for a friend in need, which means, well, look at what a good job you did with him! I am not a mother, but I have that worry gene and can relate only from the perspective of an older sister responsible for her younger brother throughout childhood. It’s not the same, but it’s a close relative. Your knitting bling is pretty! 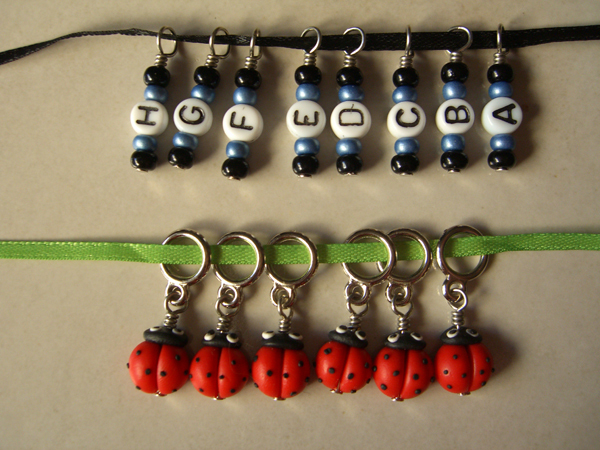 Been quietly reading your blog for awhile but I had to come out of hiding to say that those ladybug stitch markers are SO cute! I have to wait to get paid but that should be just about enough time for her to get some more up in her shop. Enabling indeed! And as far as the newly grown kid thing – I just keep telling myself that they haven’t gotten in an accident yet, so they must be being careful. Right? I sympathize with you. I remember the time my oldest took off, after work on a Friday, drove from San Jose to L.A. to meet her sister, took her to a Bruce Springsteen concert on Sat. night and got up the next morning and drove home. Ack! All that driving and late nights makes me nervous. But, you know, you can only do those kinds of things when you’re young. So I guess we should let them get it all out now! My LYS is starting a KAL for the new Cat Bordhi book and after reading this post, I had to run to the store to buy ABC beads so that we can all make our own stitch markers. I didn’t realize when I had children that I would worry about them for the rest of my life. I thought I was grown up and out of the house – no longer MY mother’s worry – the same would be true for me and mine. HA! I just had no idea what my mother went thru. I’m paying for that now – my sons are 31 and 35 and I still worry about them every day. What a great idea – I’m off to buy that book and the markers. Thanks! Found my way here via one blog, then another, and I have to say, I quite like it here. Your LYS map is utterly brilliant, BTW. Love, love, love the socks! Stitch markers what stitch markers? Maia who refuses to see the bling because then she’ll have to buy the bling. Modern English is the Wal-Mart of languages: convenient, huge, hard to avoid, superficially friendly, and devouring all rivals in its eagerness to expand.